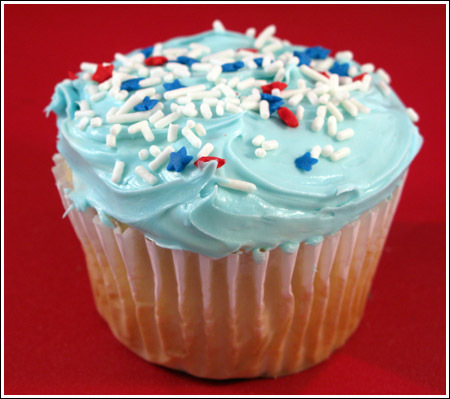 Easy recipe for cupcakes that uses cake mix, flour, sugar and other ingredients to extend the mix. Makes box cupcake taste like scratch! Preheat oven to 325 degrees F. Line muffin tin with 30 paper liners. In a mixing bowl, combine all the dry ingredients and stir well. Add the remaining ingredient and stir to mix, then beat with a mixer for about 2 minutes or until smooth and creamy. Fill the cupcake liners a little more than half full. Drop the pans lightly on the counter to bring air bubbles to the top. Bake on center rack or center rack and lower rack (changing racks halfway through if using two racks) for 22-25 minutes or until cupcakes spring back when lightly touched and are slightly brown around the edges. Yield will vary depending on what size cupcake liners you use.